The Tipsy Baker: What would the world do without me? 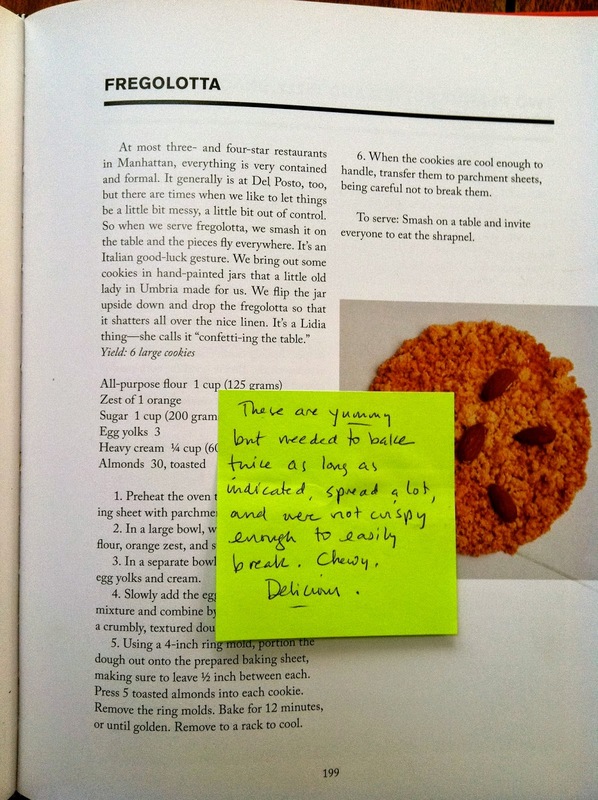 I put a note in the library copy of Fancy Desserts. Obnoxious. I'll probably take it out. A commenter expressed bafflement at my recent posts and I need to provide some context. For those of you who aren’t already avidly tracking the competition, every winter Food52 holds a cookbook contest called the Piglet modeled on the Morning News Tournament of Books. * The Food52 staff and community choose noteworthy cookbooks from the previous year and pit them against each other in a tournament that is judged by a writers, chefs, and sundry qualified and unqualified luminaries. Roz Chast, Alice Waters , and Stanley Tucci have all judged in the past and the quality, sensibility, and style of the reviews varies widely. That’s part of the fun of the Piglet. You see how different people use and value cookbooks -- and how some, like Roz Chast, don’t. In each round, a cookbook is advanced and one is dropped. At the end of the tournament, a single book prevails. Comments on the reviews can get extremely heated. I love the Oscars, but I love this a little more. The other day, writer Adam Roberts weighted the merits of Fancy Desserts by Brooks Headley against A Kitchen in France by Mimi Thorisson. I agreed with everything Roberts wrote in that charming, intelligent, and persuasive review -- except his conclusion. I’m not at all confident that Fancy Desserts is a better cookbook than A Kitchen in France. What follows will be interesting only to cookbook geeks and boy, do I feel like a cookbook geek even writing it. But here goes. The first Headley recipe I tried 10 days ago was the fake healthy chocolate chip cookies with lots of salt. (He calls them “fake healthy” because they contain whole-wheat flour.) The dough was oddly crumbly and dry, but I forged ahead and baked a batch, trusting that everything would work out in the end. It didn’t. The cookies were disastrously crumbly and dry and I threw away the rest of the dough. What had gone wrong? I pulled out Kim Boyce’s Good to the Grain (Piglet winner of 2011) to see how Headley’s recipe compared to her own renowned and impeccable whole-wheat chocolate chip cookie recipe. His recipe is identical except that he calls for an additional 3/4 teaspoon of salt and an additional 1 1/4 cups flour. No one adds 1 1/4 cups flour to a functional cookie recipe. This was clearly a mistake. Mistakes happen. But it wasn’t an auspicious start to my experience with Fancy Desserts. And what to make of the fact that, aside from a little salt, Headley’s recipe was identical to one already published and much adored? A few days later I made his fregolotta -- giant almond cookies you’re supposed to be able to smash at the table. They needed to bake twice as long as indicated and were bendable, not smashable. Delicious. But not as advertised. Random frustration: I’d been hoping to try some of Headley’s gelato recipes, particularly the cashew gelato and maybe the yeast gelato as well, if I started feeling hostile towards my family. But his recipes call for dextrose to keep the gelato soft and that stopped me in my tracks. Is he talking about dextrose powder? Liquid dextrose? This? Where can I buy dextrose? Unless I missed something, there is no such information in the book and after 10 minutes of googling, I couldn’t figure out what kind of dextrose you’d use in gelato or where to buy it. I gave up. Do you know the answer? None of this criticism of Fancy Desserts is a knock on the Roberts review. The opposite. Roberts made a strong case for the book and provided solid evidence. I had decided firmly against Fancy Desserts before I read his review and he convinced me to reconsider. So that’s what I’m doing. *The Tournament of Books is great. When people start discussing Gone Girl, I always want to tell them to go read this. I'd love to find those notes in a library cookbook. Especially the first one. There are so many good chocolate chip cookie recipes out there, and it's frustrating to waste baking time on a subpar one. There's a recipe on Food52 that started out as accidentally adding an extra cup of flour to the cookie dough. Maybe Headley was going for something like that. But it strikes me that that would be difficult to write a reliable recipe for, because results would be so dependent on the size of your eggs and the moisture content of your flour. It was just an accident, that extra flour. But frustrating to the cookbook user nonetheless! I would find it amusing to find notes in a library cookbook. Maybe I'll try it sometime. I enjoy reading the Piglet reviews but sometimes get annoyed at the lack of guidelines for judging the books. It can lead to somewhat random reviews in which it appears the judge barely actually cooked from the books. Ok, I'll leave the note in. I'd enjoy finding notes. 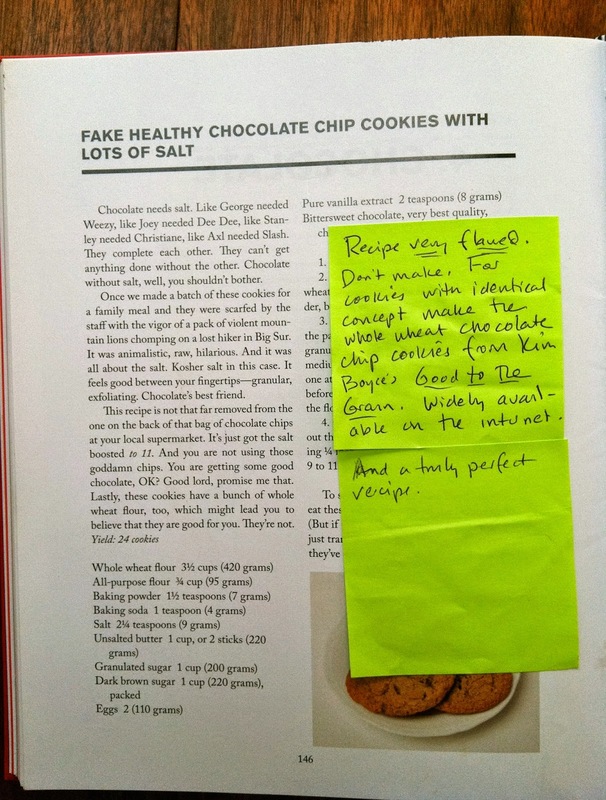 I would also like to say that I love reading others' notes in cookbooks. Some of my favorite second-hand cookbooks are full of notes from their former owners. I think it's a nice touch. The person who ends up with all my old cookbooks will find abundant notes in the books. I think it's brilliant to leave the notes in the library cookbook. Do it! I hated Gone Girl. Is that bad? It made me so angry. I just hated everyone in that book. The clever twists and turns of the writing didn't outweigh how much I disliked those characters. Recipes without clear instructions and guidance on weird ingredients also make me angry. Did you read the linked Gone Girl review? So smart. It's about how his opinion of GG changed over time and it reflected how I felt about the book. I think you'll like it. I read Gone Girl only about three months ago, I think. Maybe four. Right around the time the movie came out, I remember, because I wanted to read the book before seeing the movie. I don't remember why I even wanted to read it--did you happen to recommend it? But I was enthralled by the book and thought the movie was pretty much perfect. Rosamund Pike (who also played Jane in my favorite--heresy, I know--Pride and Prejudice adaptation) was excellent. So, several months in, I'm still in love. However, I borrowed Flynn's previous two novels from the library and they were both pretty awful. Talk about hateful characters! And no, it was not a book from our house! Seriously? You found a picture of your son in someone else's book? That is amazing. Yeah, at first it kinda creepy but I think some Mom just used a loose picture on the counter to mark a place in a book. All the little preschooler kids got to cut out their pictures from a sheet and exchange them,,,an exercise in using blunt tip scissors . I've also found electric bills from 20 years ago,,much lower rates! There is a picture of powdered dextrose on page 7 of his cookbook? I know that Light Karo can be substituted for liquid dextrose. Its a 1:1 ratio, so 2 tablespoons of powdered dextrose is about 1/4 cup of Karo? The goal is to sweeten the syrup mixture to reduce the freezing point which yields smaller ice crystals, I think. A textural thing that only matters if you are serving the gelato right away. The Fregolatta would be so pretty using five slivered almonds (like sand dollar cookies). Thank you! I didn't notice the picture. I knew the info had to be in there somewhere. Now I think I have to make his gelato. So yeast gelato? I feel nauseated just thinking of it, but I can't imagine what it is. I would go ahead and use corn syrup. I usually do when recipe calls for glucose or dextrose. Not sure it I should, but I've never had a problem. But 2 Tbs is 1/8 cup, just to correct the above info from Justme. If I understood her right. Sorry. I wasn't very clear. I was thinking that the powder (when turned into a syrup) would need to have one part water to one part powder to get to the correct solubility ratio. Therefore, 2 tbsp of dextrose powder added to 2 tbsp of water would equivalent to 1/4 cup of corn syrup. I'm sure he means dextrose powder, aka glucose or corn sugar. Amazon sells it if you can't find it locally (a good brand is Now Foods). I usually substitute it for part of the sugar in homemade ice cream even if the recipe doesn't call for it - it depresses the freezing point and helps keep the ice cream soft and scoopable. Thank you, thank you, thank you. I will pursue and make some of his gelato. I would love finding notes in a cookbook, and Brooks Headly's book sounds like it really needs some commentary to make up for the lack of testing and editing. I like the idea of the Piglet, but not the execution; the complete arbitrariness of judging puts me off. It's too bad because I do see that there are some reviewers who are judging their assigned books as cookbooks qua cookbooks (and actually cooking from them) rather than deciding on the basis of the author photo that they HATE the author and all she stands for, or rejecting a book because it's not an ode to sous-vide, or whatever itch the reviewer has to scratch that day. Also I think the whole Piglet is fatally flawed since they STILL haven't invited you to be one of the judges. Fools, the whole damned pack of them! Fools, I say! Lee, I agree with your assessment about the Piglet and am planning to organize a siege on the Food52 editors from Jennifer's fans to have her be named as a judge when it returns in 2016. Are you in? I'm in! I've already sent a message suggesting her, but was rebuffed by a generic response saying they'd already chosen the judges..... this, even though I specifically suggested Jennifer for NEXT year. Yes, I'm totally in! I will join any and all letter writing campaigns. On second thought I think I don't even like the idea of the Piglet so much as I like the idea of a cookbook tournament. I just went over and looked at some of the reviews and decisions and got rubbed the wrong way all over again. I'd like to see a cookbook tournament where the judges have to cook at least one dish from each category or chapter, and not the easiest thing (which Adam Roberts obviously did). Wait, just one more thing -- yeast gelato? Keep the cookbook geekiness coming! I could read posts like this all day. Like Lee, I love the idea of a cookbook tournament, but I don't love the Piglet. I approach every review with a slight cringe -- how misguided will this one be? That sounds snobbish, I suppose, but as a cookbook geek I have certain criteria in mind that I think are necessary to meet in order to judge a cookbook fairly and thoroughly. First and foremost — as your post illustrates — is actually testing recipes to see how well they work. If they don’t work, the beautiful pictures and the elegant prose and the intriguing concept are pointless. A few of the reviewers manage to do this; and yet even when this happens, because of the nature of pitting cookbooks from unlike categories, and because of the randomness of which recipes the reviewer chooses, even this is frustrating. The reviewer will choose to make something like a simple syrup from one cookbook, and then something like Boeuf Bourguignon from the other. I get that Food52 with its “community” philosophy would not choose cookbook experts to judge the books, and yet they do chose, if not celebrities, at least people with a “name” of some kind. And it just doesn’t work — see the Roz Chast review. She can’t even boil water, and she’s a judge? I guess I’m just not egalitarian enough. I wish there were a tournament with professionals from the food world — if not cookbook authors (which would be ideal) then at least people who know what it takes to make a great cookbook — the testing, the editing, the authenticity behind the project. There needs to be a rigorous adherence to criteria that matter. As it is, the contest is great for helping readers discover new cookbooks they may have an interest in, but that’s about it. The Piglet is stuck in an unsatisfying middle ground between entertainment and fake expertise. Like pretty much everything else in this culture. I checked out the Tournament of Books (upon which The Piglet is based) for the first time, and am really glad I did, as I'm a big reader of fiction. But it may have put me a bit off The Piglet, for the reasons you describe. In the TofB, writers judge other writing, so their judgements are based on an appreciation for the craft, the complexity or simplicity of the story, the ease or sophistication of the writing, and -- to top if off -- their opinions as readers. So they come at their conclusions from both a very broad and a very specific perspective, and they take their jobs seriously (which is not to say they don't have fun with their task, or let their personalities show). Too often The Piglet opinions are more a spotlight for the critic, and dealing with the cookbook is a snarky chore (as with the recent opening round). I do still like The Piglet, because I really am a cookbook geek. AND -- it's still fun. But I agree with your overall assessment of it. As for getting cookbook authors to judge, even that has its limitations--like when Alice Waters did it. She has too much of an agenda. What would we do without you? I shudder to think. Your take on Piglet is better than Piglet. What machine do you use/like for gelato?? When I saw the picture of Mimi Thorisson's book cover in your last post, I instantly thought it was a picture of you. You look a lot like her, though substantially less pretentious. Did you notice that in pretty much every picture her hair is in front of one shoulder and behind the other? She seems to be pretending to be candid. Makes me cringe. That said, I bet I'd like her recipes.